Ryan Judd consoles himself with the thought that it’s a dry cold, as he patiently waits for a bite. Brad Knowles doesn’t care much for bananas. Not when he’s fishing, at least. “Did you bring bananas?” he asks from the driver’s seat. I check with my son Ryan, sitting across from me in the back of Brad’s truck. No, we didn’t bring bananas. We check our packed lunch. No bananas, although the hot chocolate seems to have spilled. Bananas will jinx fishing every time,” says Brad, who double checks that his assistant guide, Matt, has not brought bananas. Matt, a bass fisherman from Mississauga – where he’s known to some as “The Bassassassin” – knows better than to bring bananas. We’re on our way to Blackwater Lake, about an hour out of Whistler, east of Pemberton. 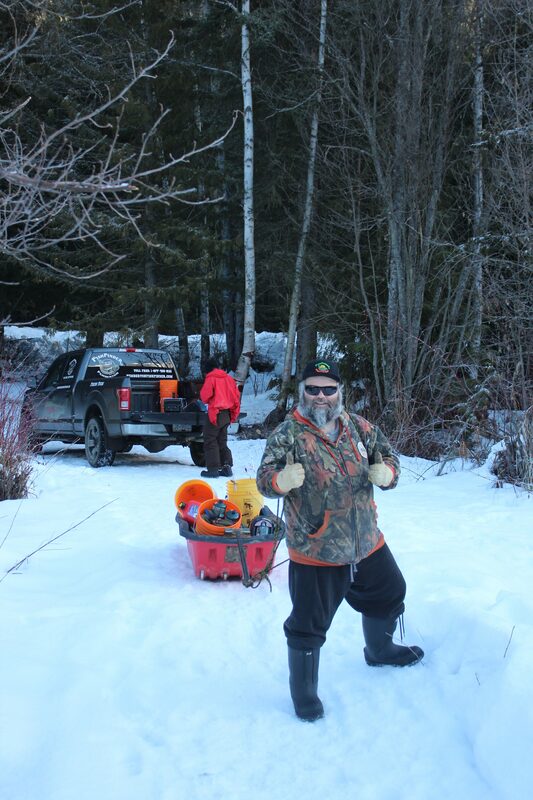 From mid-November to late-March, give or take, the 6.5-kilometre lake near D’Arcy is ice fishing country. 6.5-kilometre Blackwater Lake, about an hour out of Whistler, east of Pemberton. 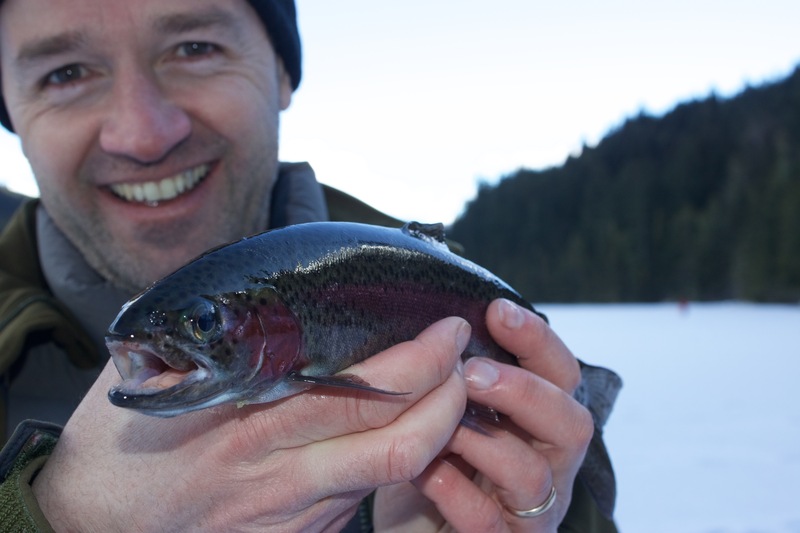 At this time of year, Brad’s company, Pemberton Fish Finder, runs ice fishing tours. “It’s for people who want to escape the Whistler bubble and experience the lakes, wildlife, catch some fish and listen to some stories,” says Brad. Brad has lots of stories. He grew up in Pemberton and is something of a local celebrity, starring in his own fishing show on Whistler Cable for a while. Together with running a fishing store, Pemberton Fish Finder keeps him busy year round. My only adult fishing story involves a crab trap and a capsized canoe. I had always assumed ice fishing would involve a flight to Prince George or Edmonton. Brad Knowles, owner-operator of Pemberton Fish Finder. Blackwater Lake is idyllic. Serrated peaks loom all around us and under blue sky, the ice is blinding. The air temperature is just below freezing, there’s no wind, and the sun is flirting with the clouds. But for a creek in the distance, the only thing I can hear is my heart beating. Brad sets about cutting holes in the ice with a gas-powered auger. He and Matt set us up with rods and we bait the hooks with freshwater shrimp, which are native to the lake. Everyone gets an upturned bright orange bucket and a thermal pad to sit on. And that’s it, we’re ice fishing. We immediately get bites. Brad and Matt coach us on setting the hook, otherwise known as the hook-set – a quick upward thrust of the rod before reeling in. One by one though, we lose the bites and rue our bad luck. “Well there’s a reason it’s called fishing and not catching,” says Brad. After about an hour, Brad carves out new holes and we spread out. Under his guidance, I switch bait from shrimp to trout roe. Ryan and Matt are several hundred yards away but the air is so still, it’s easy to talk without raising our voices. A lone whisky jack keeps us company, occasionally stealing a shrimp from the bait bucket, and otherwise mocking us. 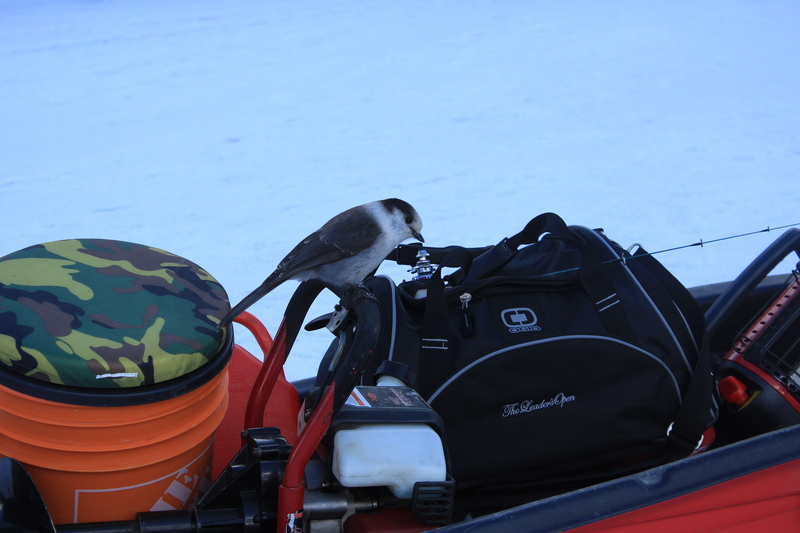 A lone whisky jack steals bait and taunts us. Brad’s been fishing in this region for about 35 years, chasing all five salmon species, plus pike minnows, steelhead, cutthroat, bull, brook, lake and rainbow trout. Together with his dad, Ivan, and his brother, Sheridan, Brad has carved out a living here and now employs his wife in the guiding business while raising three kids. “There’s not a day I don’t wake up and look at the mountains, excited to go to work,” he says. I can see why. Fish or no fish, Blackwater Lake is quite an office. There’s a small forestry campground nearby with a dozen sites and in summer, lily pads and extensive weed beds flourish here. And somewhere beneath our boots and buckets today are rainbow trout ranging from 10 to 25 inches and weighing as much as six pounds. Just as I’m beginning to think the shrimp bait looks tasty we decide that it’s lunchtime. Brad carves pairs of holes a few inches apart and sets up a shelter in seconds. We’re not cold but from inside the shelter the water appears even clearer through holes that take on a luminous quality. “Sometimes you can see the fish before you catch them,” says Brad. For now, we watch our bait descend beyond sight and remain ever hopeful. No bites but the sandwiches help. As 2 o’clock nears, Brad suggests we concentrate on a shaded corner of the lake. We exit the shelter and set up one last time, trying to ignore the creeping cold. I start to wonder whether one of us is actually carrying a concealed banana. Then I think back to growing up in the UK. As a schoolboy, I used to accompany friends on night-fishing trips in the Kent countryside. In two years of those fishing trips, I never caught anything but a cider hangover. It occurs to me that not only have I never caught a fish, I’ve never actually seen anyone else catch a fish. One rainbow trout, about 10 inches long and just in time for dinner! I decide not to share this thought with Ryan, and instead concentrate on the hole, which I realize is freezing before my very eyes. Then I’m shaken from my thoughts. “YEAH!” shouts Brad. I turn just in time to see the rod bend for a moment and a plump rainbow trout flop into Brad’s palm. “No way we were going before we got one,” says Brad as we celebrate the catch. It’s closer to the 10-inch end of the scale and a beautiful looking fish. Hopeful of more to come we continue fishing for another half an hour, but to no avail. “That’s fishing,” says Brad philosophically as he drops us back in Whistler. Ryan and I both warm up while a friend cooks our catch. It’s more than worth the wait: fresh, flavorful and not even a hint of banana. 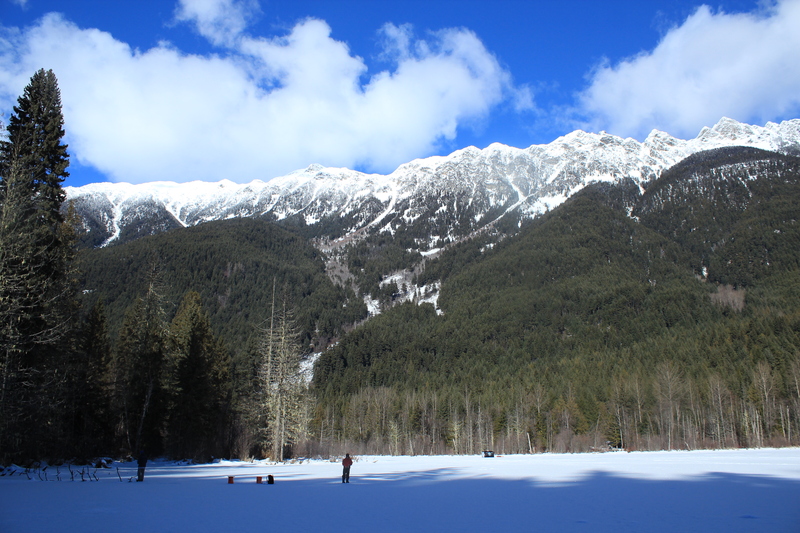 For more information about guided ice fishing trips with Pemberton Fish Finder, visit pembertonfishfinder.com.